Providing you the best range of crescent cushion with buckwheat filling, yoga belts, yoga & acupressure accessories, zafu cushions, bolsters cushion with cotton filling and yoga straps with effective & timely delivery. 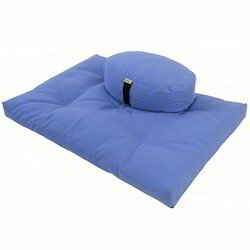 The Crescent Cushion with Buckwheat Filling offered by us is a moon shaped meditation cushion. These cushions are designed and made to give high level of comfort and stability during the practice of your yoga or meditation. The Zafus that we offer you are densely filled with buckwheat. These Meditation Cushions have small zippered openings neatly hidden between the plates that help you in removing the cover at the time of washing. We offer these Crescent Cushion in a vast range of colors, textures, sizes and designs. The Yoga Belts that we offer you are very useful and assist you in attaining correct postures by providing the required tension of a pose without strain. These Belts are extensively used for binding in postures. 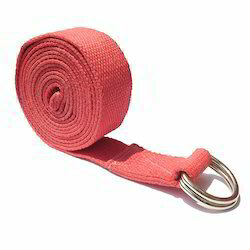 You can avail the both standard and extra-long Yoga Belts. We offer you a choice of Metallic buckles or ABS nylon ‘D & H’ rings that lock the belt firmly and are easy to adjust. You can wash your Yoga Belts in washing machine at 40 degrees. Color Red, Blue, Orange and many more. We take care of the best practices used for fitness. Yoga/Meditation/Acupressure Accessories are designed to assist with correct yoga practice and to improve alignment while avoiding strain. The use of props helps to increase one’s understanding of yoga postures and makes yoga practice more accessible to all. Meditation aids are used to enhance concentration and help in doing meditation effectively. These aids help achieving better sitting postures without strain on the body. 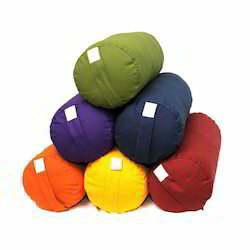 The vast array of premium quality meditation aids offered by us consists of Meditation Eye Pillows, Meditation Zafu, Meditation Zabuton, Meditation Cushions, Meditation Singing Bowls, and Meditation Ting Shag Cymbals. 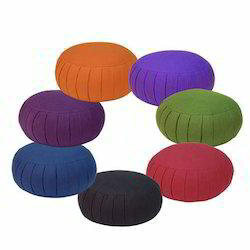 The Zafu Cushions offered by us is a round shaped meditation cushion having pleated sides. These cushions are designed and made to give high level of comfort and stability during the practice of your yoga or meditation. The Zafus that we offer you are densely filled with 100% cotton and are used as a solid cushion. These Zafu Meditation Cushions have small zippered openings neatly hidden between the plates that help you in removing the cover at the time of washing. We offer these Zafu Cushions in a vast range of colors, textures, sizes and designs. Backed by a team of adroit and dedicated professionals, our firm is involved in manufacturing, supplying and exporting a wide variety of Bolsters Cushion. 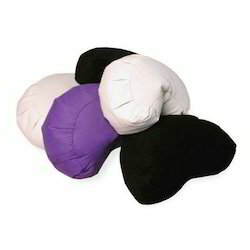 Available in several specifications, these Bolsters Cushions are filled with Cotton. In order to sustain the reliability of the products and ensure utmost client satisfaction, we offer these Bolsters Cushions after testing them. Somani Enterprises offers you a choice of Metallic buckles with ‘D & H’ rings shape that lock the belt firmly and are easy to adjust. The Yoga Straps that we offer you are very useful and assist you in attaining correct postures by providing the required tension of a pose without strain. You can wash your Yoga Straps in washing machine at 40 degrees. Backed by a team of adroit and dedicated professionals, our firm is involved in manufacturing, supplying and exporting a wide variety of Bolsters Cushion. 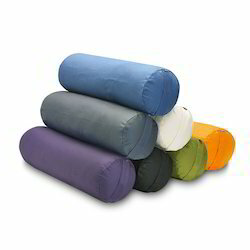 Available in several specifications, these Bolsters Cushions are filled with buckwheat. Due to buckwheat filling, bolster will mould to your body for perfect posture In order to sustain the reliability of the products and ensure utmost client satisfaction, we offer these Bolsters Cushions after testing them. Backed by a team of adroit and dedicated professionals, our firm is involved in manufacturing, supplying and exporting a wide variety of Zabuton Cushion. Available in several specifications, these Zabuton Cushions are filled with buckwheat. Due to buckwheat filling, bolster will mold to your body for perfect posture. In order to sustain the reliability of the products and ensure utmost client satisfaction, we offer these Zabuton Cushions after testing them. Color Dark Colors- Purple, Blue, Cherry and etc. To shield your eyes from light and to apply a gentle relaxing weight over and around the eyes, use our Eye Pillow. Pillows made from fabric such as cotton or silk and filled with Lint Seeds and Lavender Scented which helps in relaxing tired eyes. The best quality eye pillows are available in market.